The bible tells us that God planted a “tree of knowledge” right alongside normal fruit-bearing trees in the Garden of Eden (see Genesis 2:9). 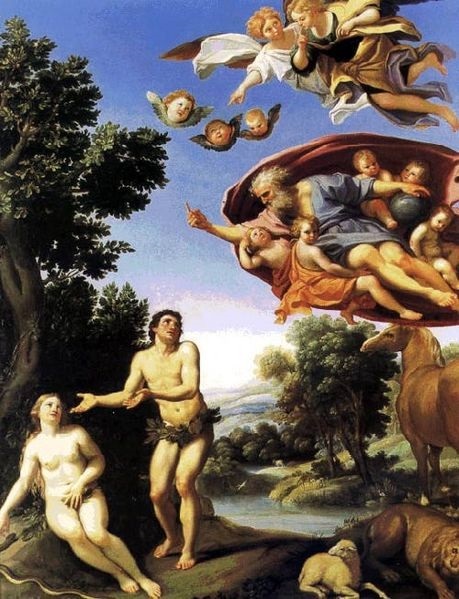 This “knowledge tree” gave the partaker of its fruit the ability to discern the difference between what is good and what is evil, with scripture once again pointing to that force which produces evil and wickedness, and which, as we have seen, already existed prior to the creation of Adam & Eve. Now God, it must be emphasized, had the free-will not to introduce the tree of knowledge into the Garden. He also had the free-will to either bar Satan from entering the Garden altogether, or to allow him in. So what could possibly have been God’s purpose in planting the knowledge tree in the young pair’s midst if not to cruelly and malevolently place evil within man’s easy reach! And Satan being given free access to the extremely vulnerable pair! What are we to make of that ? Baffling to no end is why Christians willfully choose to ignore the fact that Eve had absolutely no idea what “evil” even was prior to digesting the forbidden fruit. Therefore, she could not possibly have possessed true “free-will” until after the point of consumption. Eve, strictly speaking, had been a mere automaton up until the fatal moment; with Eve following Satan’s directives just as readily as she would God’s. She had not even an inkling that following Satan’s counter-directive would cause here to “sin” until after she had consumed the fruit. Those that believe otherwise fail to grasp the fact that Eve could not possibly have known she had “disobeyed” God if “disobeying” God was an “evil” one became aware of only after consuming the forbidden fruit. It is as simple as that. Ignored too, is the fact that Eve had been tricked into “sinning”; tricked by a God-created supernatural creature using God-bestowed supernatural powers to accomplish his wicked deed! Now, how just and fair was God in light of that ! God stood by and “watched” as events unfolded and did absolutely nothing to “save” Eve and, eventually, mankind from the fall from grace. What does that tell us about the moral character of Christianity’s so-called “loving” God! So was Eve truly guilty of “disobeying” God if she had no idea what disobedience really was? To say “Yes” is to say Eve knew the difference between right and wrong and understood that disobeying God was evil prior to the partaking of the fruit; a position that is clearly contradicted by scripture. So, in the end, who really tempted Eve into sinning? Was it Satan? Or was it actually God Himself―who merely used Satan as his implement of choice? Think about it. We need to question why Satan was not simply barred from Eden altogether―let alone even allowed to exist! Did God not know ahead of time what would happen? And how is one to explain the presence of the “knowledge tree” in the Garden? Was not the tree a booby-trap (figuratively speaking) just waiting to be detonated? What was God “thinking“? The math is simple: No “knowledge tree” or Satan in the Garden = No “sin” on the part of Adam & Eve = No need for a crucified Jesus = an eternity full of happiness and joy for mankind. It is as simple as that. But such happiness and joy was obviously not part of God’s “Divine Plan,” now was it? Memo to all believers: You need to take off your rose-colored blinders and get real. Or do you believe what transpired is clear-cut evidence of “Intelligent Design”? In the end, we have discovered a supposed “unimaginably intelligent” super-being who Christians worship as God who freely chose to invent evil, and freely chose to allow an unsuspecting and incredibly naive Eve to be lied into sin by Satan―while doing absolutely nothing to protect her! We need to ask: “Why not ” ? What “good” has come about as a result when weighed against the “bad”? The outcome has been an unmitigated disaster for human-kind―as well as the rest of the animal world. As for Eve: her “Heavenly Father” was surely derelict and deficient in his Fatherly duties. Don’t you think? Ask yourself: Would it be “okay,” for a father to stand by and watch his infant baby drowning in a bathtub and not lift a finger to save it? Well that is the moral equivalent of what Eve’s Heavenly Father did in regards to her and Adam. To compound matters, God is said to have known ahead of time that his creation, Satan, would succeed in his efforts through God’s supernatural “omniscience”―yet chose not to prevent it! That was criminal. That was unconscionable. God was not helpless. He was malevolent. Lucifer (the serpent) was created with vast knowledge and power. He could easily achieve influencing a human being’s brain by using mental telepathy, which is the power of directly projecting thoughts from one human brain to another, or from a source in the spiritual world to a human brain; but Lucifer’s power was, and still is, limited to a person who accepts the lies about God, Jesus, or the Bible. This is shown in the Bible when Jesus was tempted by the devil, who tried to inject thoughts into Jesus’ brain; but Jesus rejected the devil’s thoughts by knowing the truth in the Bible and applying it to satan’s thoughts. Thus, defeating satan who had to stop trying to inject thoughts into Jesus’ brain. to see who is really exerting His evil and full control over Satan. You will not like what you are about to discover. But it is undeniable–if you believe the Bible to be true, and yet can still think critically. Remember, I am a dyed-in-the-wool atheist who has found no reason whatsoever to believe in the existence of God or Satan. None at all. Perfect rational explanation. Unfortunately religious people won’t have the courage to read or comprehend this simple matter.